SPOKANE, Wash. - For the fourteenth consecutive year, Banner Bank and the Spokane Indians will team up to reward deserving high school seniors with college scholarships. Five area students will be selected to receive a $500 scholarship based on achievement in leadership, community involvement, scholarship, and character. 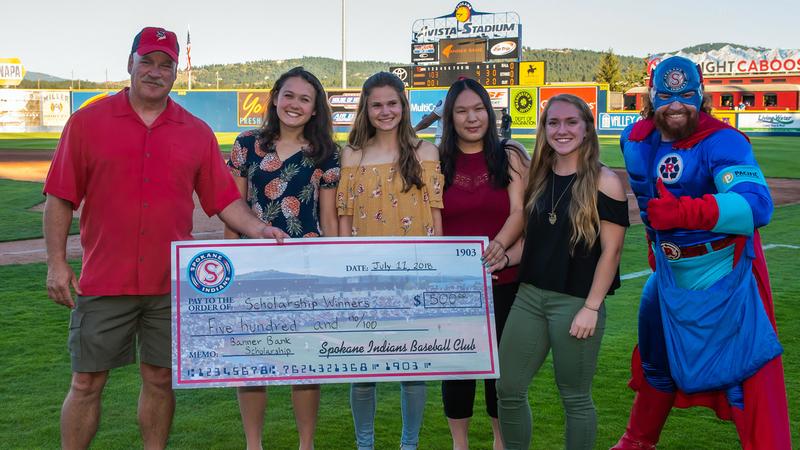 "Hard work and dedication deserve to be rewarded-that's why we are pleased to again partner with the Spokane Indians to award five deserving students with college scholarships," said Keith Weathermon, Banner Bank Senior Vice President. Any high school senior in the graduating class of 2019 attending a high school within Spokane County and Kootenai County and/or a member of one of the six (6) regional tribes (the Coeur d'Alene Tribe, the Colville Tribe, the Kalispel Tribe, the Kootenai Tribe, the Nez Perce Tribe, and the Spokane Tribe) is eligible for this scholarship. Applications for the scholarship are due to the Spokane Indians office by Friday, May 3rd, 2019. CLICK HERE for more info and to apply. "It's gratifying for us to know that as an organization we've had a direct impact on education for over a decade," said Indians Senior Vice President Otto Klein. "We love celebrating great students in our community." Students interested in receiving a Banner Bank Scholarship application should contact their school's scholarship coordinator or email Darby Moore at dmoore@spokaneindians.com for more information. The Spokane Indians are the Short Season Class "A" affiliate for the Texas Rangers. Avista Stadium is home to the $5 Bench Seat courtesy of Multicare. CLICK HERE to reserve your seats today. Parking at all Spokane Indians games is FREE. The Spokane Indians Team Store is open M-F 9:00 AM - 5:00 PM, and 10:00 AM on all game days.